I am cheating with the author attribution in the headline here, but it seems in keeping with the tone and atmosphere of Madame Solario. 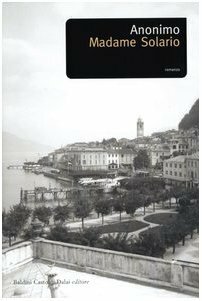 The novel, set at a fashionable Italian resort on Lake Como in September 1906, first appeared in 1956 without an author attribution but soaring sales in both the U.S. and U.K. soon provoked journalistic curiosity. Within a year, the author was revealed as Gladys Parrish Huntington — American-born, but at the time of publication “an elderly literary gentlewoman…living in the backwater of Kensington”, according to a 1957 Life magazine article. The original “anonymous” authorship had sparked speculation that the novel, with its undercurrent of scandal and intrigue, was autobiographical. Huntington was quick to dismiss that notion: while she had spent summers at Lake Como in her youth, Madame Solario was entirely the product of her imagination, she said. In the gay scene that met the eye during the season, women’s clothes were the dominant note. And in the year 1906 women wore long skirts that moulded the hips and just escaped the ground; waists were small and tightly belted; busts were full and bodices much trimmed. Voluminous chiffon veils were the summer fashion. A veil would be thrown over a large hat and float over the shoulders, down to the waist or below it. So much clothing and embellishment turned each woman into a sort of shrine and where there is a shrine there is a cult. The social atmosphere of that epoch was particularly loaded with femininity. That kind of fashion, carried over from England’s Victorian age which had ended only five years earlier, both provides protection and invites speculation from prying eyes. It is the perfect metaphor for what “life” is like at Cadenabbia: ornately formal and controlled on the surface, bubbling with gossip, rumor and intrigue underneath. In an unconventional structure, the author divides her story into three very different parts — I’ll respect that here, because the different points of view that she uses are vital to fully appreciating the book. A young Englishman called Bernard Middleton, who had just arrived in Cadenabbia, was responding to the atmosphere, prepared to admire and to enjoy himself. He had expected to be joined there by a friend and was met by a telegram that instead told him his friend had been taken ill at St. Mortitz and could not come yet. Bernard was a little lonely at first, but by the second day he could see patterns emerging out of the first bright impressions of the crowd, and was hoping that he might be included in a pattern — which one, he could not yet say. Looking on, he was amused and interested also by the cosmopolitan character of the company. He was still alive to the interest of being abroad, and indeed much was novel to him, for he had little experience of the world. Indeed, Bernard is far from having acquaintance with that world. A recent Oxford graduate, his family is well-off enough to finance a European summer for him and have plans for his future — a gross disappointment to him since they have decided that he will return to England to become a clerk in his uncle’s bank rather than take up a post in the Foreign Office, his preferred option. Even that latter career would have left him scrambling to find a place in one of the Como “patterns” (“clique” or perhaps the less judgmental “set” would be the more modern term). Basically, they come down to three: an Italian group of Roman semi-aristocrats, a younger group of rich Americans featuring party-loving daughters on the lookout for continental husbands and “everybody else”, a mix of wandering East Europeans, Russians and English, particularly one Colonel Ross, distantly related to Bernard but more importantly for the novel the social rover who helps him move from set to set. In the opening part of the novel, Bernard (mainly on the strength of his fashionable dress) punches above his social weight — far enough above, that he feels somewhat shakily secure in developing an attraction to Ilona, the daughter of the Hungarian Countess Zapponyi. It is through this attraction that he becomes aware of the Russian, Kovanski, a foreboding character who seems to inspire both love and fear in Ilona — perhaps an affair gone wrong? — that soon has Bernard preoccupied with worry. The table that had been assigned to him was by the wall, not far from the door, and two columns hid part of the dining room from his view. At a table at this end of the room — just beside a column — was Madame Solario, also dining alone. He saw her after he had sat down, and he wondered what was the correct thing for him to do. Should he bow first? It was impossible always to look away, and the moment came when he met her look. She inclined her head with a slight smile, and he felt relieved. That was over. But it was astonishing that she should be sitting alone. She must have been the only woman in the room to be by herself, and it gave her singularity in more senses than one. Nearly all the other tables were like dinner parties — he could hear, if he couldn’t see them all — and why was she not at one of them? Madame Solario soon becomes the vortex around which all the other “patterns” and their activities will swirl — attached to none, but an influence on them all. Hapless Bernard, equally unattached in his own way, finds himself hopelessly dragged into aspects of them all, since he is only dimly aware of the “rules” of resort society. It is a convenient device for the author: by the end of Part One, the reader is beset by almost as much confusion of high society detail as Bernard. And then Bernard virtually disappears from the novel. Part One ends with the arrival of Madame Solario’s brother, Eugene Harden, someone she has not seen for 12 years. If Bernard’s confusion was the focus of Part One, Part Two centres on the back story — and present challenges — of Madame Solario and her brother. That contrast in names (Solario and Harden, sister and brother?) offers the first hint of the complexity of both past and present, one that takes the author more than 150 pages to fully explore. It has a global geogaphic range from Cincinnatti to South America to Paris, before arriving at Lake Como. We never get full concrete details but a scandalous affair, an arranged marriage and a duel are only a few of the elements that are included in it (rest assured, the disturbing Kovanski plays a major part). If the intricate layers of spa society in Part One are confusing (and they continue to become more densely involving in Part Two), the mess of the past of Madame Solario and her brother — and what they each propose for the future — takes the plot to a whole new plateau. All of that sets up Part Three — conveniently described as departure from Lake Como, but that is hardly adequate. Bernard does re-enter the story as Madame Solario’s “escape” accomplice — the author takes the escape spinning from Milan to Florence and back again. The conflicts in Madame Solario’s life (and Bernard’s confusion) don’t so much get resolved as they do further muddied. Those who like tidy resolutions are bound to be disappointed, but it is a realistic continuation of the tension between surface and undertow that were integral to life at the Lake Como resort. Despite it’s original sales success, the novel has been out of print for some time, although used copies are readily available. I have an affection for “spa” novels (Mann, James and Wharton are all personal favorites) and when Guy Savage at His Futile Preoccupations reviewed Madame Solario I tracked down a copy immediately, although it has taken me some months to get to it. For many readers, the formality and intrigue of the spa society of declining European aristocrats (and arriviste rich Americans) are inherently phoney and frustrating — for those of us who appreciate an occasional escape into that unreal world, Madame Solario deserves to be read. If you do like the genre, you’ll find a number of suggestions for other “resort” novels in the comments sparked by Guy’s review. And Madame Solario has finally been made into a movie, with a French-language production released in September, 2012, although reviews suggest the film does not hold much promise: “a gorgeous backdrop for an otherwise yawn-inducing portrait of the rich and decadent” was the Hollywood Reporter’s capsule assessment. That negative judgment doesn’t surprise me: you can’t make Lake Como anything but gorgeous, but I am afraid the characters of the novel are simply too complex to make the transition to film.